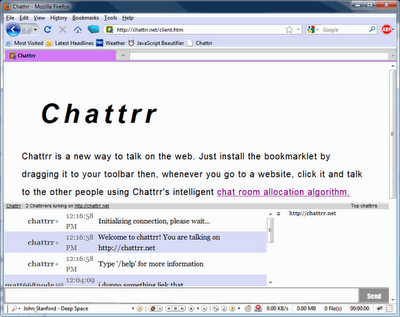 Chattrr is a novel new way to chat. 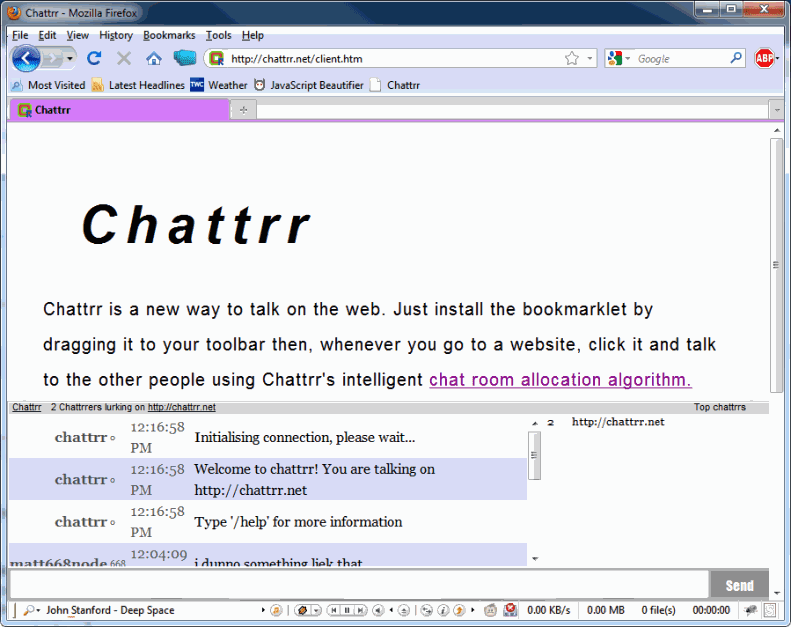 It's a bookmarklet which utilizes an intelligent chat room allocation algorithm to connect you with other Chattrr users who happen to be browsing the same website. Picture yourself at an art gallery. Perhaps you're puzzling over why someone would pay $140 million for a Jackson Pollock. Someone else strolls in, and they, too, find a common thread to chat you up about. Others come, looking at the same thing, which might remind one of a high school art project they didn't take seriously, another of a haphazard work of "art" slapped together by a chimpanzee one afternoon. Then a fine arts major strolls in and decrees everyone else to be philistines for disparaging such a fine work of "art". So it is with Chattr, which enables a whole new level of conversation, in real time, among people with eyes trained on the same content. 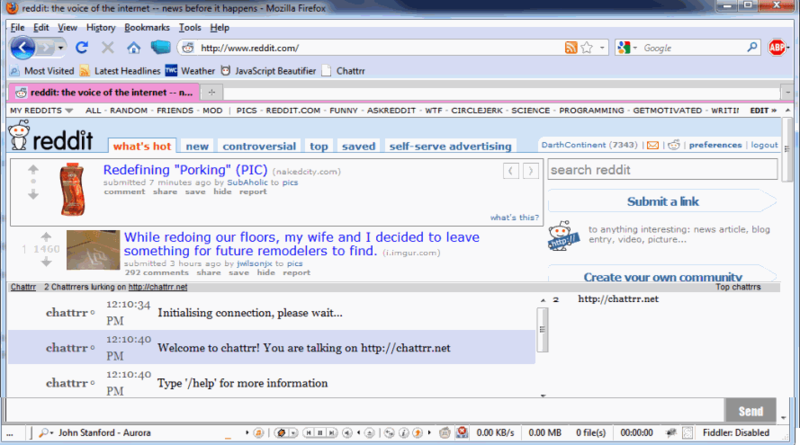 By applying the real-time chat of IRC atop otherwise relatively static nature of website commentary, I think Chattrr has carved itself a unique niche in the realm of social networking. 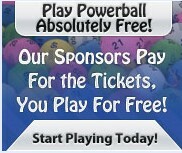 Whereas you might post a comment on a blog and wait days, even weeks for a response, finding someone to chat with via Chattrr means instant discussion with whomever else is looking to share their thoughts about the experience, particularly for discussion based forums and sites like Reddit, where at any given moment thousands of people may be commenting on the news of the moment. While the tool has only recently debuted, it is fully open source, has been tested successfully with Firefox, Chromium, Chrome and Safari, and in my mind is the start of something wonderful.